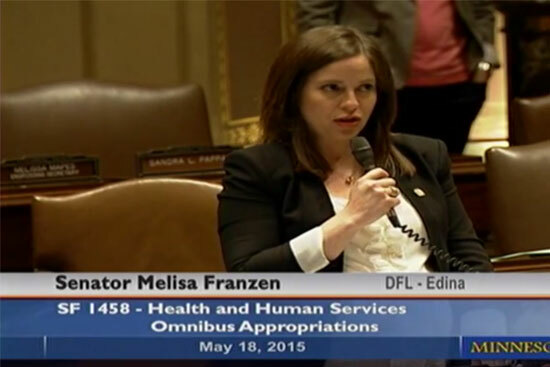 Senator Melisa Franzen is currently serving her second term in the Minnesota State Senate after her election in 2012, and subsequently in 2016. She represents Senate District 49 which includes the communities of Bloomington, Eden Prairie, Edina, and Minnetonka. Senator Franzen currently serves on the Taxes and the Transportation and Public Safety Finance Committees. She has previously served as the Vice Chair of the Health and Human Services Committee, on the Education Policy Committee and was a member of the Capitol Area Architectural and Planning Board. She has been a lifelong volunteer in her community growing up in Puerto Rico where she was active in Girl Scouts and 4H. Senator Franzen is also the former President of the Minnesota Hispanic Bar Association and Regional Vice President of the Hispanic National Bar Association, and formerly served on the Board of Directors for the Girl Scouts of Minnesota and Wisconsin River Valleys as well as the Comunidades Latinas Unidas en Servicio (CLUES). She resides in Edina with her husband, Nathan, and their two sons Philip and Arthur. They enjoy traveling and going up north to their cabin in Finland, Minnesota.